The twentieth century saw the rise of a very new movement: the peace movement. Groups sprung up across the world to defend the rights of women to the rights of brute animals. But in some instances, in the process of trying to support their cause, these groups have resorted to violence. We leave it to you to decide who is right and who is wrong. They are in no particular order and, with the exception of two entries, are all relatively recent. Glitter bombing cannot be blamed on any one group or organization. It has become a fad by which pro-gay rights activists protest anyone who speaks out against gay rights. The legality of throwing glitter on someone without warning falls in the gray area between assault and harmless prank. Those with an easy-going sense of humor have usually laughed it off, but it does rub plenty of people the wrong way, and Mike Huckabee, among others, decries it as assault and battery, and possibly sexual harassment. The latter definition he bases on the premise that some activists proclaim the victim gay upon being glitter bombed. It is, of course, an example of disturbing the peace, public humiliation, assault with intent to commit psychological harm, and perhaps invasion of privacy. 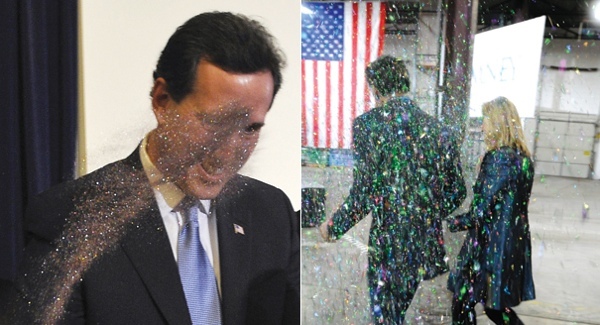 Mitt Romney was glitter bombed twice during his presidential campaign and the second time, the assailant was dragged away by the Secret Service and pled guilty to disturbing the peace. He served no time. Al Pieda is pronounced as a rhyme with “al-Qaeda,” and it is a self-described terrorist organization in the United States (with splinter cells across the world), that protests all things conservative, especially any supposed intolerance against gay rights. 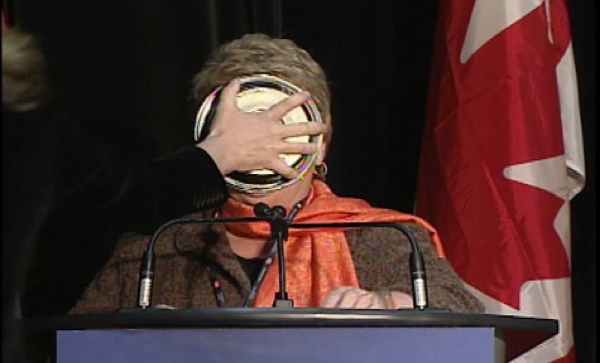 Their modus operandi is to throw a pie right in the face of the person they feel opposes their stance. The Biotic Baking Brigade is precisely the same organization, just a little more organized and official. People for the Ethical Treatment of Animals touts itself as a nonviolent protest organization, but has also engaged in pie throwing. The pieing of Bill Gates is rather famous across the Internet, but it doesn’t count, since he was pied just for fun by a single prankster. But Ann Coulter and William Buckley have been pied for being conservative and public opponents or supposed opponents of gay rights, feminism, and ecology (global warming). They also pied Fred Phelps, of the Westboro Baptist Church, which, as deserving as it was, only galvanized his movement to be even more inflammatory. The pieing groups demand equal rights for homosexuals, animals, women, and more. Legally, pieing is assault, and quite a few members of these groups have been arrested and tried for it. Greenpeace is probably the most visible peace championing organization in the world, present in over forty countries. Their goal is to “ensure the ability of the Earth to nurture life in all its diversity.” They are an environmental watch group that tries to stamp out nuclear weaponry, deforestation, reverse the trend toward global warming, and especially fight back against overfishing the oceans. They make no secret of their contempt for commercial fishing, notably whaling, which still goes on legally around the world. Among commercial fishers, the Japanese have roused the ire of more than just Greenpeace by their wholesale slaughter of bottlenose dolphins, an intelligent and decidedly cute species of mammal, for human consumption, despite the well established fact that dolphin meat is toxically high in mercury. On 8 January 2006, the Greenpeace vessel Arctic Sunrise deliberately rammed the Nisshin Maru, a Japanese whaling ship attempting to avoid the Sunrise as best it could. Unfortunately, whaling ships are very large and do not maneuver very well. The much smaller Sunrise was given ample warning to get out of the way but continued directly into the side of the Maru. The video captured of the incident was filmed by Greenpeace and distributed under the explanation that the Nisshin Maru was the one that acted aggressively, and that the Arctic Sunrise simply refused to move. ELF states that they use “economic sabotage and guerrilla warfare to stop the exploitation and destruction of the environment.” They have a presence in at least seventeen nations worldwide, including the United States, almost all of Europe, parts of Asia, Australia, and New Zealand. They do not have actual offices or any headquarters, but are instead a covert, splinter cell organization operating under the protection of anonymity. Their actions require this secrecy, as the FBI has declared them the highest priority of domestic terror threats. They pride themselves on being animal liberationists, anarchists, anti-capitalists, and eco-feminists. ELF first came to prominent notoriety when they burned down a ski resort in Vail, Colorado, causing twelve million dollars in damage. They did this to stop clear-cut logging and protect the lynxes in the surrounding forests. They have burned down parts of the campus of the University of Washington, in Seattle, and have claimed responsibility for over 400 SUVs and humvee vehicles burned in dealership parking lots. They are probably responsible for the so-called “Street of Dreams” house fires, on Echo Lake Road, in Washington in 2008. 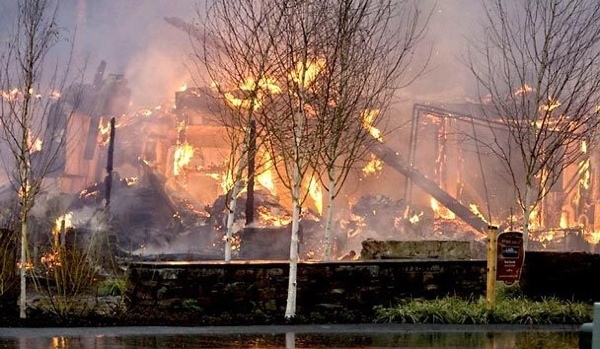 Three mansions were razed to the ground, while a fourth was put out in time, causing seven million dollars in damage. The Suffragettes, as they dubbed themselves, were women who demanded the right to vote. Suffragism had been a long-ongoing affair. In the United States, women were not nationally given the right to vote until the 1920 presidential election. Protests for the right did not gain ground quickly until they became violent in England by 1912. Here, women began burning mailboxes, chaining and handcuffing themselves to staircase bannisters in courthouses and other municipal buildings, and even setting off explosives in public squares, streets, and post offices. Some of these women were imprisoned and force-fed through tubes inserted down their throats into their stomachs when the refused to eat. The British government deliberately let some of them starve until too weak to participate in pickets and marches, then released them from prison. This was all because the British government did not approve of women voting. 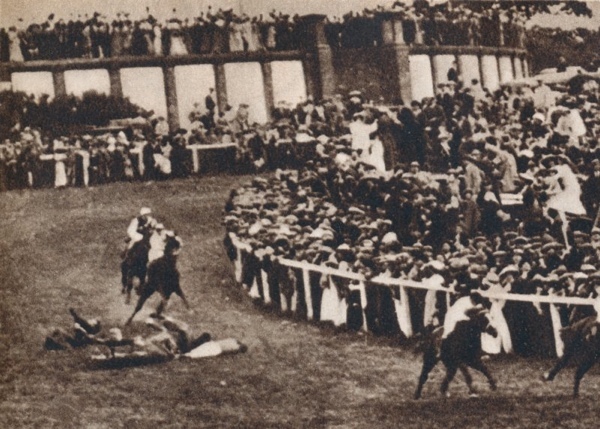 On 5 June 1913, Suffragette Emily Davison went to the Epsom Derby, a horse-racing venue, and deliberately charged out onto the track during the middle of a race in order to slap a suffragism banner onto the rump of King George V’s personal horse, Anmer, as he galloped by. George was not riding him. Unfortunately for her, horses do not care if women have the right to vote, and the jockey was unable to rein him in or away from her in time. Anmer bashed into her, sending her flying onto her back, fracturing her skull and sending broken ribs into her left lung. She died four days later. Neither Anmer nor the jockey was injured, and they completed the race. The violence did help immeasurably, and British women were granted the right unconditionally in 1928. We all know Mandela was the primary driving influence for the anti-Apartheid movement in South Africa. Apartheid is Afrikaans for segregated, and was the South African regime from 1948 to 1994, during which time, Afrikaners—white descendants of the Dutch, Germans, and French—ruled the nation and deprived blacks of many human rights. Mandela began fighting back almost immediately upon its inception in 1948, and sternly advocated direct action, not merely passive non-violence. He admonished the other members of his organization, the African National Congress, to acquire weapons for their own defense, but never to attack anyone without provocation. He appeared to be conflicted about this, since he publicly advised a mode of non-violent, non-cooperation in the style of Mohandas Gandhi. By 1955, Mandela conceded that violent resistance was the only method that would work to end Apartheid’s civil rights violations. Mandela is known to have fought back physically against the Apartheid riot police at over three dozen different protests, marches, and parades. He founded Umkhonto we Sizwe , or Spear of the Nation, in 1961, and ordered its members to engage in sabotage, cutting communication lines and blowing up railways, to weaken the Apartheid government. If this failed, he promised that “guerrilla warfare and terrorism” would be put into effect. On 16 December 1961, his organization bombed fifty-seven separate businesses, law firms, courthouses, and vehicles. No one was killed but people were wounded. 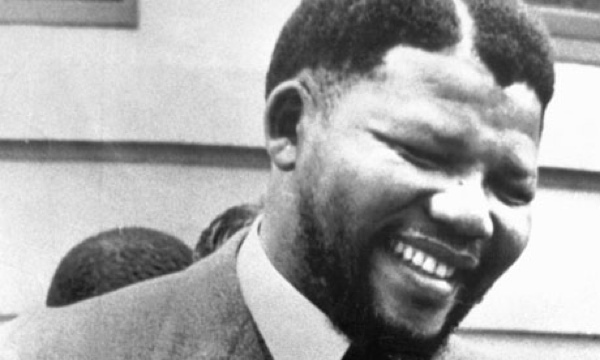 Mandela was caught on 5 August of the next year, tried, and sentenced to life in prison. He spent twenty-seven years in prison before being released in 1990. Apartheid did not end until well after Prime Minister Pieter Botha left office the year before due to a stroke. 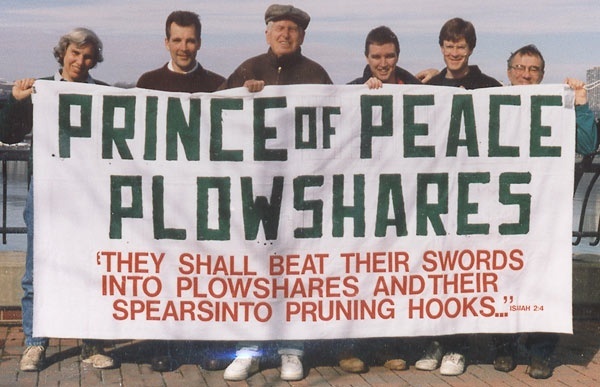 The Plowshares named themselves after Isaiah 2:3 and 4, the famous “beating swords into plowshares” passage. This passage is meant to represent true world peace, and the movement considers itself a group of Christian pacifists, although their actions said otherwise on 9 September 1980, when they broke into the General Electric nuclear missile and storage base outside King of Prussia, Pennsylvania. The movement was founded by Daniel Berrigan with the sole intent to eradicate all nuclear weaponry from the planet. They claim utter nonviolence toward people, but violence toward property inasmuch as it will hinder a nation’s nuclear weapon capabilities, and over eighty such violent actions have taken place on four continents to date. Their first act, on the Pennsylvania nuclear missile base, resulted in the demolition or damage of eight nuclear warhead nosecones. They had no idea whether their actions would trigger the devices, but luckily for many people in the area, the devices were designed with five safety measures and could not be detonated in the first place without first being armed, and they were not. They did, however, contain weapons-grade plutonium, which the Plowshares nearly exposed to open air. This would have killed every one of them and probably many more in the immediate area. They also broke into two research offices and tore up classified documents, then poured cow blood over them and the furniture. They were arrested after breaking windows alerted guards who raised an alarm. The eight original members were all personally involved, and all spent ten years in prison before their appeal resulted in new sentences and they were paroled with time served. The Sea Shepherd Conservation Society is similar in mission to Greenpeace. They are the basis for the Discovery Channel’s Whale Wars reality show, which has been renewed for a sixth season. The show chronicles the SSCS’s repeated aggravated harassment of Japanese whaling vessels, usually off the coast of Antarctica. Their avowed goal is to eradicate the practice of whaling by “direct action,” a euphemism for violence. One incident has become well-known across the Internet, which took place on 6 February 2009, when the SSCS vessel Steve Irwin, named after the late crocodile hunter, apparently sped up behind the Yushin Maru 2 and swung its bow into the side of the Maru’s stern, quite like a police officer’s pit maneuver against a fleeing car. There were two whaling vessels involved, the other named the Yushin Maru 1, which was at the time, hauling a dead whale into its slipway for butchering. The Maru 2 had harpooned the whale. Paul Watson, founder and president of the SSCS, stated that the collision was the result of either reckless driving or a deliberate assault on the part of the Maru 2. The Japanese have attested that they were simply doing their job when the Irwin arrived and rammed them deliberately. The Japanese attempted to drive the Irwin off by firing water cannons at them, and through the use of LRADs, which are very powerful, painfully loud sonic weapons that can perforate eardrums from half a mile. The collision nearly capsized the Maru 2. The video of this incident has been incorrectly labeled as an attack by Greenpeace, but SSCS has proudly taken responsibility and maintains that it did nothing wrong. The original Tea Party was instigated by the British taxing the thirteen American colonies to the point of usury. The colonies were founded by people attempting to get away from oppression in England, but the British had an all-powerful navy and were able to keep the colonies in check, first through peaceable means, during which time the British and Americans allied against the French and various Indian tribes, then through violent coercion. By the time of the American Revolution, the British had long since been treating the colonies as a money-making enterprise. Almost everything was taxed, to the point that the Americans simply had no money left for themselves. 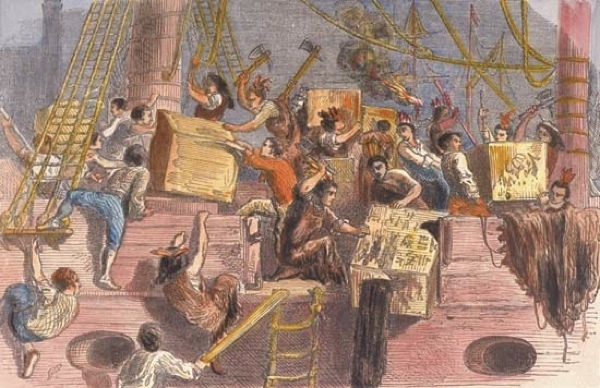 The Sons of Liberty were founded to demand less taxation through the use of violence if necessary, and on 16 December 1773, anywhere from thirty to 130 Sons of Liberty, incited in part by Samuel Adams, boarded three British merchant vessels in Boston, Massachusetts Harbor and spent three hours chopping into 342 large chests of tea and throwing them and their contents overboard. This tea had been shipped to America with an impossibly high tax levied on it. Every colony but Massachusetts bowed to the colonists’ demand to return it. The incident infuriated the British and is marked as one of the specific instigations of the Revolution. Think about this one in a new light. The Synoptic Gospels recount that Jesus entered Jerusalem triumphantly on what is now called Palm Sunday, and immediately assaulted the men exchanging money and selling livestock in the Temple. The people had been generally enthusiastic during His entrance based on the miracles He had performed and the fact that He had healed everyone who approached Him with such a request. He dismounted his donkey and on sight of the money changers and merchants, Jesus flew into a rage, the only time in the Gospels when He really loses his temper. The money changers’ coins would have been stacked on the tables, and Jesus slapped the coins across the floor, threw the tables over, opened the bird cages and threw the birds out to fly away, made a makeshift whip and drove all the livestock away and probably took a few swings at the men themselves. The Synoptic Gospels’ placement of this event at the beginning of His final week of mortal life seems more likely than John’s, in which it takes place long earlier in His ministry. It is seen as one of the most imminent compulsions of the Jews’ decision to kill Him. He had already aggravated and frustrated them for three years by doing absolutely nothing for which they could arrest Him, and yet He drew thousands to His ministry and expressly away from theirs. 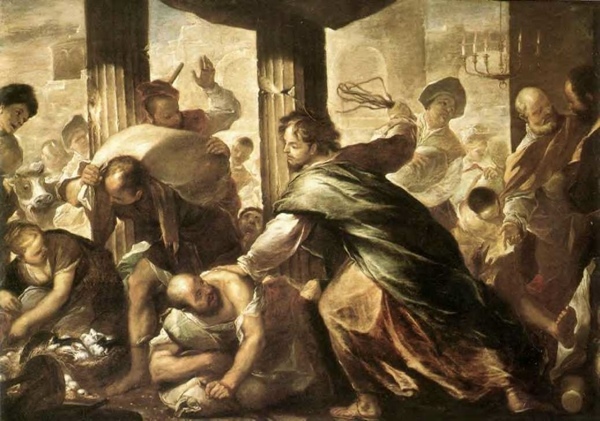 His act of clearing the Temple may be seen as what some organizations of the peace movement call “direct action.” He did not actually harm anyone, but even modern societies would have viewed His action as assault and attempted to arrest Him for it.